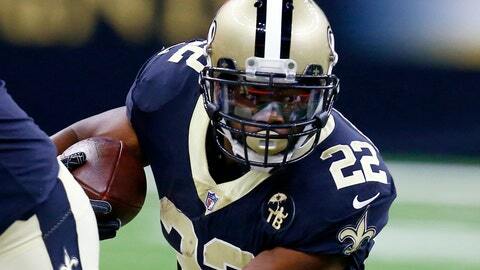 CAN YOU START SAINTS RB MARK INGRAM IN HIS FIRST GAME BACK FROM SUSPENSION? There’s no substitution for real-life game action and Ingram isn’t likely to be in midseason form for a couple of weeks, but it’s not like he will be asked for 20-plus carries this week. He’ll still be sharing some carries with Alvin Kamara as he gets back into game shape. In his last game against Washington last November, Ingram rushed for 134 yards, scored a TD and added three receptions for 21 yards. Ingram does have a favorable matchup as Washington has yielded 4.5 yards per carry (YPC). You’ve compensated without him for four games. If you’ve got a good alternative option at RB for Week 5 and prefer to sit back and evaluate how he’s used, do so. If your team is stacked at RB, this may also be a good opportunity to gain full value for him in a trade. If you lack depth at RB, you drafted him so that you can start him in Week 5. WHAT’S GOING ON IN THE SEAHAWKS BACKFIELD? CAN YOU START MIKE DAVIS? Unfortunately Davis is not a plug-and-play RB yet. With Chris Carson surprisingly scratched in Week 4, Davis rushed for 101 yards, scored two TDs and caught four passes for 23 yards. Coach Pete Carroll has suggested that Davis and Carson will both be featured in the Seahawks backfield. First-round pick Rashaad Penny will focus on kick returns. Perhaps Penny’s pass protection skills haven’t improved enough to merit RB1-type playing time. One thing is certain. If Carson is out again this week, Davis should be the Seahawks RB of choice. If Carson is healthy, expect him and Davis to split carries. Unfortunately, the Seahawks have a late start Sunday, so you may have to opt for a safer choice if your other RB of consideration plays an earlier game. SHOULD DOLPHINS RB KENYAN DRAKE STILL BE CONSIDERED FOR YOUR STARTING LINEUP? Kenyan Drake has rushed the ball eight times for an average of 1.33 YPC over the past two weeks. He’s 24 years old. Frank Gore has rushed the ball 17 times for 3.12 YPC during the same time span. He’s 35. Gore isn’t exactly lighting it up, but if Drake’s coaches believe that Gore’s a better option than Drake at this stage of the game, then Drake belongs on your bench. WHICH UNDER-THE-RADAR RB HAS AN OPPORTUNITY FOR A BIG WEEK? The Chiefs lead the NFL in rushing yards per carry allowed with 5.7 and have given up the most fantasy points per game (FPPG) to opposing RBs in point-per-reception (PPR) scoring formats. The Jaguars already announced that second-year starting RB Leonard Fournette will miss Week 5 due to a hamstring injury. That should pave the way for backup T.J. Yeldon to have a big fantasy week against the Chiefs. Yeldon has already posted double-digit fantasy points in PPR scoring in three of the first four weeks of the season. John Brown leads the Ravens with three TDs in the first four weeks of the season and he’s posted double digit fantasy points in PPR leagues in each game. His opponent, the Browns, have given up the eighth-most receiving yards to WRs and when healthy, Brown can stretch the field. He is second on the Ravens in targets and second in the NFL in air yards, a predictive stat measuring a WR’s potential intended receiving yards based on a QB’s pass attempts. WHICH TIGHT ENDS MAKE SENSE TO STREAM THIS WEEK? Unfortunately the pickings are slim but Ricky Seals-Jones takes on a 49ers defense that’s yielded the seventh-most FPPG to TEs and at least one TD to the position in each of the first four games of the season. As you probably know, there’s not much going on in the Cowboys passing game, but Geoff Swaim has averaged six targets over the past two weeks and scored a TD in Week 4. Tight ends are averaging 10.1 yards per pass attempt and have caught three TDs against his Sunday opponent, the Texans. C.J. Uzomah and Tyler Kroft are two other names to watch this week as they’ll be filling in for injured Bengals TE Tyler Eifert for the rest of the season. Uzomah has more routes run than Kroft this season, but Kroft scored seven TDs after filling in for Eifert last season. With Seahawks TE Will Dissly out for the season, Nick Vannett can eventually emerge as a streaming option. IS THE JAGUARS DEFENSE REALLY THAT GOOD? The Jaguars have given up the fewest FPPG to QBs, the seventh-fewest FPPG to RBs and the third-fewest FPPG to WRs and TEs. Yes, they are that good. That doesn’t mean that you should sit fantasy stalwarts like RB Todd Gurley or WR Antonio Brown against them. However, if you have a fringe fantasy player on your roster who has a matchup against the Jags and a backup with a more favorable individual matchup, choose the player with the better matchup. WHICH DEFENSES SHOULD I EXPLOIT ON A WEEKLY BASIS? The Chiefs have a way of making your fantasy RBs look good. Broncos RBs Philip Lindsay and Royce Freeman combined to carry the ball 20 times and averaged 6.8 YPC against the Chiefs on Monday night. Kansas City has also given up the most FPPG to RBs. The Arizona Cardinals have given up the second-most FPPG to RBs and have surrendered a league-high 141 rushing yards per game. The Bucs, Chiefs, Saints and Steelers have all been consistently weak against the pass.